If you have ever been caught in a hail storm, you know how quickly you can go from “Wow, how cool!” to “Ah, everything I’ve ever owned is ruined!” Not only can hail storms be devastating to vehicles, but they can also damage your roof. And unlike a car, you can’t move your home under shelter until the storm passes. While Tennessee is not in the heart of the hail belt, we are no strangers to hailstorms. 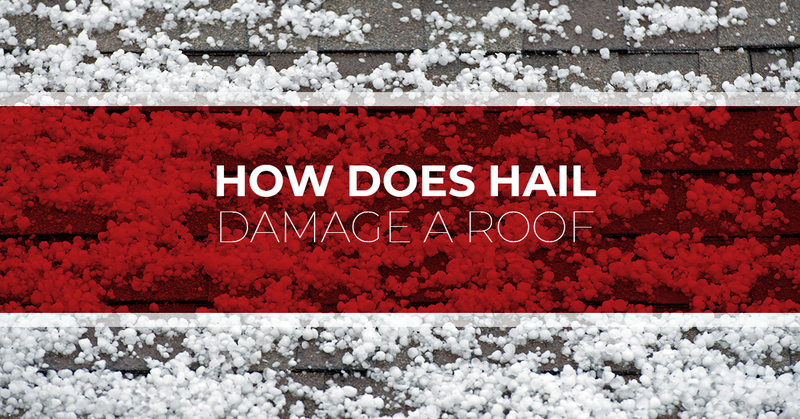 The amount of damage caused by a hailstorm can vary greatly, and in today’s blog, we here at Tim Leeper Roofing would like to discuss some of the factors that affect the damage, what to look for after a hailstorm, and what to do if your roof has been damaged by hail. If you are in the Nashville area and in need of commercial or residential roofing repairs, replacements, or simple inspections, contact your go-to roofing contractors — Tim Leeper Roofing. Size and Density — the size and density of the hailstones are probably the most significant factor in the degree of damage caused. From pea-sized stones to grapefruit-sized stones, hailstones come in almost all sizes. On top of this, they are not always smooth and rounded. Hailstones with rough edges will typically cause more damage. Wind — part of what makes hail storms so dangerous is the fact that they are often accompanied by severe weather. Not only does the wind pose a threat to objects around your home, but it also determines the location and severity of hail impacts. Barriers — if your home is surrounded by natural barriers like trees, landscaping, fences, and neighboring homes, this could affect the impact of the hailstorm. Roofing Materials — the roofing materials on your home play an essential role. While asphalt shingles may be punctured by softball-sized hailstones, a metal roof with a high-impact resistance may emerge unscathed. In addition to the type of material, the age of the material is also key to how well it withstands impact. If you find yourself outside after a hailstorm, scratching your head, wondering what to look for, we are here to help. Keep in mind that you should never climb up on your roof unless you have proper safety attire and are completely confident in your roofing abilities. Below is a brief guide on what hail damage looks like. While these problems may seem and look minor, you would be surprised by how something, like missing granules, can compromise the shingle and increase the likelihood of a leak forming. If you are performing your own post-storm inspection, take pictures and mark relevant spots with chalk. It’s worth mentioning that if you plan on filing an insurance claim, most insurance companies are looking for 8+ hail hits within a 10ft x 10ft square. When trying to spot hail damage, metal roofing is perhaps the easiest material to inspect. During the hailstorm, it may sound like your metal roof is getting obliterated, but most homeowners are pleasantly surprised when they see just how unaffected their metal roof was by the storm. This is because many modern metal roofing systems offer excellent resistance to hail impact. Most metal roofs are rated on a scale from one to four, regarding how much hail damage they can withstand. Learn more about metal roofing here! In addition to inspecting your roof after a hailstorm, you will also want to take a close look at roofing fixtures and gutters. When these are damaged, they will not be able to function properly, potentially wreaking even more havoc on your home. For example, if your gutters have sustained severe damage, water can overflow, causing damage to your sidewalks, landscaping, siding, and even foundation. Never let a damaged fixture or gutter go unchecked. With all this being said, it is important to remember that the true extent of the damage can be difficult to accurately assess from the ground. Often times, in fact, it can be invisible from ground level. This is especially true of hail that is between the size of a quarter and a golf ball. This is why it is important to be thorough with your roof inspection. If you think your home may have sustained damage from hail, and you are not prepared to handle your own inspection, contact professional roofing contractors as well as your home insurance representative. If you are in the Nashville area and in need of roofing contractors to perform a residential or commercial roof inspection, repair, or total replacement, contact Tim Leeper Roofing. Learn more about us and our roofing services, and contact us today at 615-553-2782 to schedule your free, no-hassle quote.